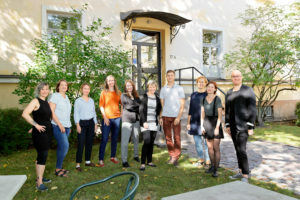 Members of the research group from left to right: Vanessa May, Sirpa Wrede, Anastasia Asikainen, Laura Kemppainen, Anne Kouvonen, Anna-Leena Riitaoja, Nuriiar Safarov, Ulla Buchert, Veera Koskinen, Antero Olakivi. mobility and diversity in the context of ageing and care. As large scale immigration is a reasonably new phenomenon in Finland, little is known about how older people with a migrant background organize their lives and care in Finland. The main research themes of the group are care needs of older people with a migrant background and ethnic hierarchization of the care workforce. Care needs of older people with a migrant background are studied widely from the perspectives of health and wellbeing, social ties, technology use as well as citizenship and everyday life. Special attention is given to various forms of misrecognition and to the examination of the underlying causes for possibly differential access to care provisions. It is also scrutinized how existing asymmetries could be overcome. Ethnic hierarchies of the care workforce are examined in relation to changing conceptions of professionalism and professional knowledge in care work and the simultaneously growing importance of migrancy as a new category that organises the workforce in social and health care. Both of the above mentioned research themes are studied by using qualitative and quantitative data. and directed by the Professor Teppo Kröger at the University of Jyväskylä.